Find the german Version by clicking here! After seeing the film True Cost it became clear to me that I no longer wanted to support the fast fashion industry. But since I also enjoy wearing new outfits and living creatively, I have been looking for good sources for cool fashion over the years. Sales of clothing almost doubled between 2002 and 2015. In 2014, 100 billion new garments were produced while in Germany people buy about 60 new garments per year (Greenpeace 2017). So we buy much more than we really need. The most distressing aspect is that these garments are mostly produced in unethical, unsafe and sometimes life-threatening facilities. Women and children are exploited for the most part. The picture becomes even gloomier when you realize that there are still lots of old clothes on the market that are no longer worn and cannot be resold. In addition, large fashion chains such as H&M simply dispose of many unsold items or even burn them (kurier.at 2017). However, there are some possibilities to change something here as a consumer. Fair fashion is on the rise, you can do without the consumption of clothes for a while, reduce it and at the same time hold large corporations accountable and demand sustainable and fair production. 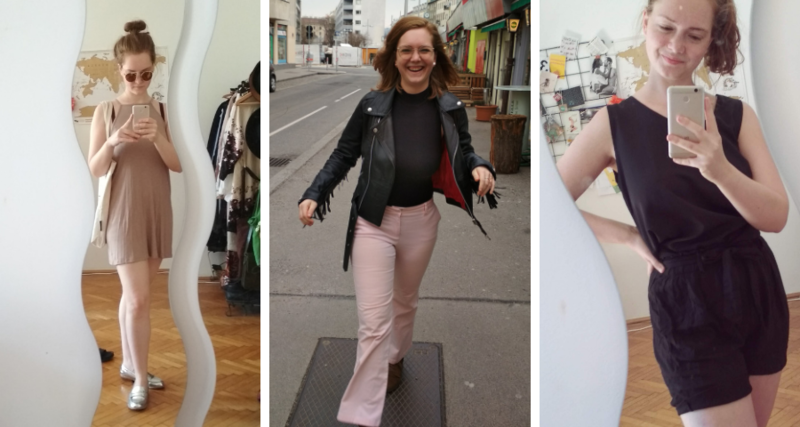 Since there are some Fair Fashion bloggers* who have great tips, I’ll list a few of my favorites here and concentrate myself on the ZeroWaste alternatives for great fashion. In general, you should ask yourself the following questions: „Do I really need this? Do I have something at home that can fulfill the same function? Do I already have something like this at home? Does the piece go well with the rest of my stuff?“ If you’re not sure or you’ve come across a great piece while wandering around, let it be put aside for yourself and sleep on it again. By now I only buy things myself when I’ve really thought about it for a long time, when I really need it and/or when I can’t get it out of my head. But since fair fashion also has to be produced first, I like to fall back on already existing clothes. My favourite source here is clothing from my mum, sister, roommate or friends*. 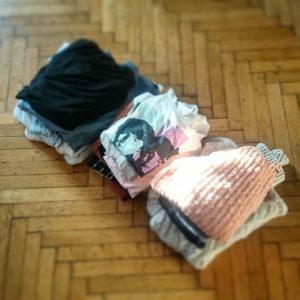 I also sort clothes out myself again and again, especially since I’m on a minimalism trip. So are some of the favourite women around me. Every now and then I can choose great things from these friends. Thanks to you power women! Top-Swaps are very similar to this. I like to go to private parties from my circle of friends here, because you can also combine swapping with chatting. However, there are now also many exchange parties on a larger scale and professionally organized. Since I have already experienced many variants of Top-Swaps, next week an article will follow with tips and tricks for the implementation of your own party! Another great way to get special clothes is to borrow something. In Austria there is for example the Start-Up Endlos Fesch. There you can find very unique pieces at regular pop-ups. You pay a rental fee for a number of items, can wear them for a month and then bring them back. 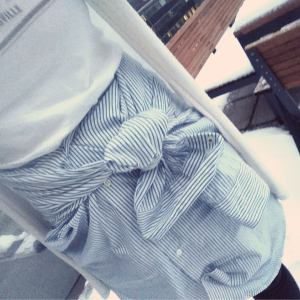 I also think it’s great to wear my clothes at home in new variations. My favourite trick here is to wear a men’s shirt as a top or skirt or a T-shirt the other way round. This can change a whole look completely. Just try it out, combine it anew and let your imagination run wild! It is also important to try to repair broken clothes before disposing of them. Old T-shirts can also be used as cleaning cloths. You can also reduce the amount of new clothes by sewing them into new ones. I still ask my grandma for advice or try out simple changes myself. If you really want to buy something, secondhand shops are a good option. There are also online variants out there! So this was a long article and if you’ve read it so far, you’re great! I’m looking forward to your comments about your experiences with ZeroWaste Fashion. Write your favourite second-hand shops and fashion sources here as well! *Disclaimer: Ad, becouse of linked sites and products/not sponsored!